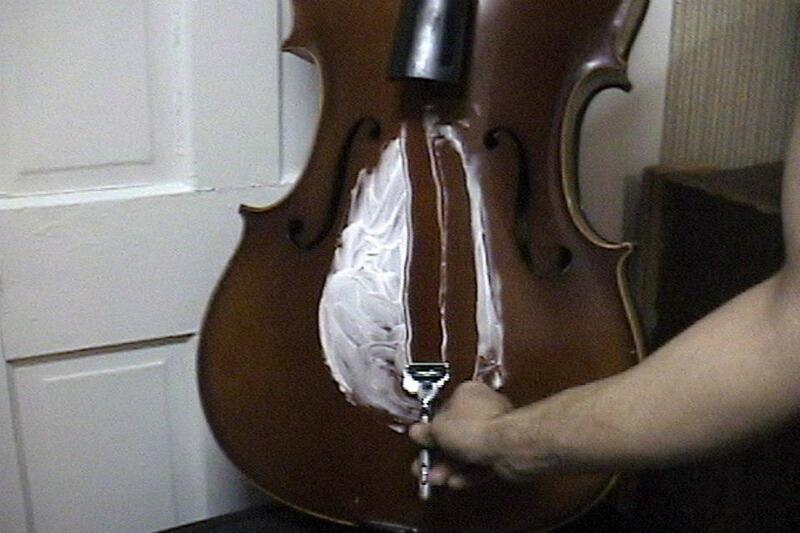 Still from “le violoncelle de Silpayamanant” Experimental video short from 2001. 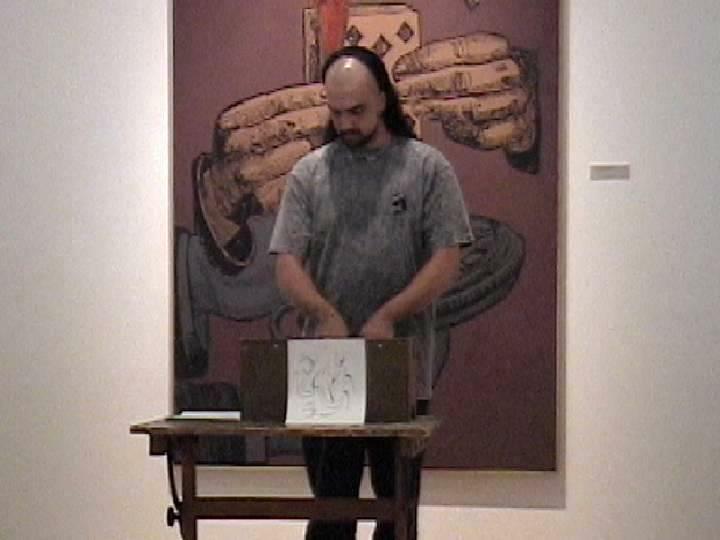 First shown during a live multimedia installation performance by Jon Silpayamanant at the Emerson Art Gallery, DePauw University in 2002. I wish this would have happened while I was there, but also, in a way I’m glad it didn’t. While I was a student there, and despite the more traditional conservatory-like experience which often felt a bit stifling, I was invigorated while I discovered a world of possibilities. I’m pretty sure I was a frustrating student to many of my professors (including my cello prof, Eric Edberg) but I think most of them survived me–hah! I thought I’d take this opportunity to blog a bit about my overall impressions of my undergrad music school experiences (and some beyond) since I’ve been reconnecting with it in various ways recently. These were on the six full orchestra concerts we performed. These concerts also included more standard 20th century repertoire by Stravinsky, Bernstein, Copland, Rachmaninoff, Prokofieff, Menotti, Vaughan Williams, and Kabalevsky as well as some older chesnuts. The two joint end-of-semester Orchestral/Choir concerts featured Benjamin Britten’s “St. Nicholas Cantata” (1948) and Maurice Duruflé’s “Requiem” (1947) and the touring DePauw Chamber Orchestra’s program 912 concerts) included a program of early twentieth century works (Henry Cowell, Ravel, Berstein, Copland, Stravinsky) bookended by Mozart’s “Marriage of Figaro” Overture and Beethoven’s first symphony. So, in the 20 orchestral concerts I performed in my freshman year nearly all the works were 20th century compositions, and many of those were works composed within ten years of our performances. The DSO went on to perform many other premieres and works by Dr. David Ott (composition professor and composer-in-residence with the Indianapolis Symphony Orchestra) though none of the programming quite matched that 90-91 season. 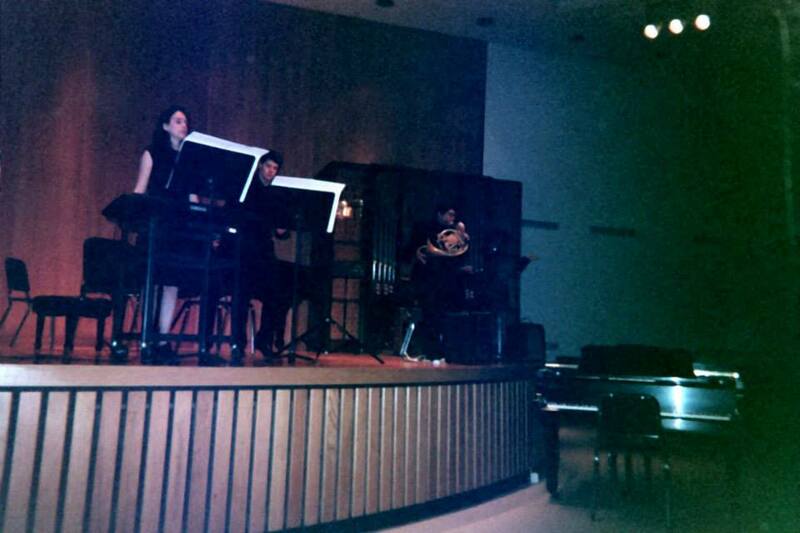 This was probably my first band–a composer formed ensemble led by Eric Chesney, a composition major. We organized and performed a few shows in music school as well as at The Broken Spoke (a “pub” type restaurant found in the campus Student Union Building). We also, informally, performed Eric’s senior composition recital in 1993. Our instrumentation included saxophone, flute, strings, as well as a Fender Rhodes which was a bear to haul around! This was the resident ensemble of the 20th Century Music Literature Class taught by Dr. Carla Edwards. Obviously the roster rotated by class but many students were allowed to be involved in the concerts the group put on and I often sat in on classes and occasionally gave talks about what was then the latest trends in new music and the intersection between performance art, dance, experimental theater, and non-academic experimental music. While I participated in the concerts I performed works by Harry Partch, Cathy Berberian, John Cage, and text/sound pieces by Fluxus artist Jackson Mac Low and Dada artist, Kurt Schwitters. 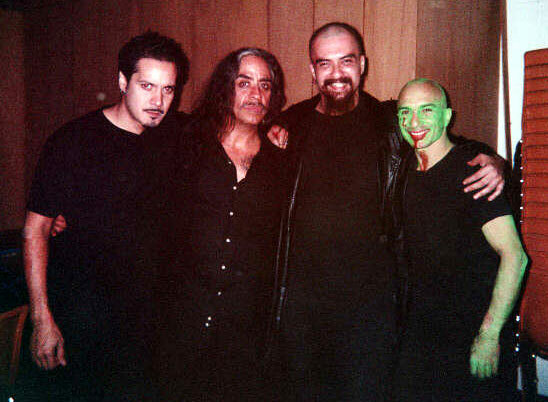 We also premiered one of my compositions, “Tao of Mu: Better Living Through Non-Lexical Communication” (for amplified horn, keyboard, voices, turntables and electronics, found percussion, magnetic tape) in 1999 which I had written for Robert Garcia. Barbara Paré started offering a Vocal Chamber Music class. I had started working with a mezzo-soporano student, Kate Haynes by that point as I wanted to explore repertoire for cello and vocals (of course now I get to do that alone as I sing and play the cello quite often). We did end up performing a recital in May of 1996 which included one contemporary work by James Mulholland– his “Four Love Songs” (1983) for voice, cello, and piano. During the Vocal Chamber Music, we did have the opportunity to work on other older standards as well as Berstein’s “Dream with Me” (1950) for voice, cello, and piano as well as doing some readings of my composition, “Recueillement” (1996) for voice, cello, and french horn (played by Jeff Radcliffe) and based on text by Charles Baudelairre. I said above that I’d been reconnecting in various ways with my DePauw experience above and here’s one of the reasons. My new music group, the Mothership Ensemble, just performed Jeff’s “Mandala” this Wednesday at Lisa’s Oak Street Lounge. We’ll be repirsing the performance again next month at Classical Revolution Louisville and on a full concert we’re giving at Decca with other compositions by local composers (Rachel Short, Chris Kincaid, and me) as well as other newer-ish works by Andriessen, Denisov, and Ian Clarke. Jeff was also a regular member of the DePauw Contemporary Ensemble and had written a couple of other works for me. We’re all looking forward to performing more of his pieces in the near future. He is also one of the brightest and most talented and adventurous people I’ve ever met and someone who attended a few of my Chello Shed events (about more later) as well as writing a spoof on Philip Glass’ “Einstein on the Beach” (titled “Einstein at the Hub”) which we performed at the DePauw Playwright’s Festival (1997) which featured 10 minute plays by DePauw students in the new Elizabeth Kerr Black Box Theatre. Using texts he surreptitiously acquired by a handheld recorder while in the Hub (another restaurant in the Student Union Building) and from the prices of items for sale he constructed three vocal lines which the three readers (I was one) spoke aloud in random and monotonous fashion while a customer (played by Matt Kingston) wandered around confused by the dizzying number of items for sale all while the “Spirit of the Hub” (played by ICE‘s Eric Lamb) danced around and tempted him to purchase more. Jeff played the keyboard in Glass style. Jeff also introduced me to Bang on a Can, and I am forever grateful for that, especially as I recently got to see former BoaC cellist, Maya Beiser, live a couple weeks ago. 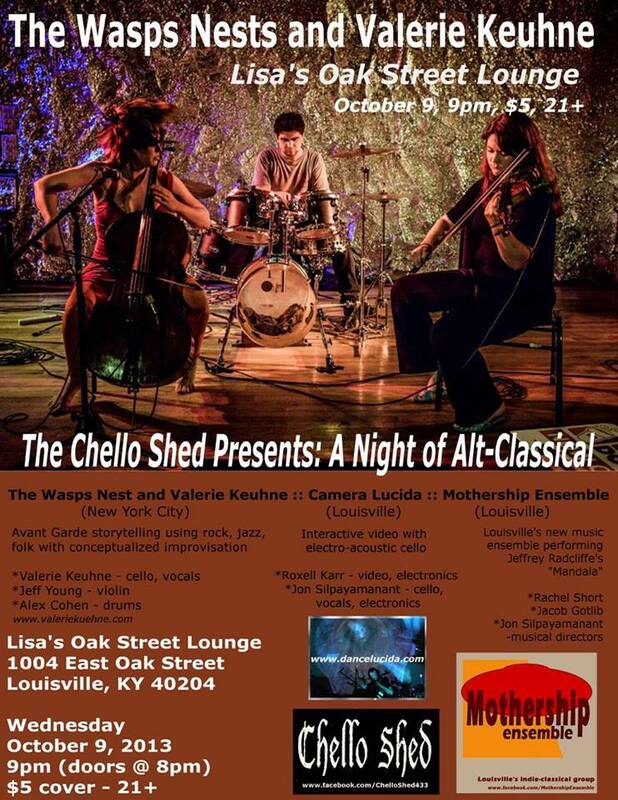 The Chello Shed was a brainchild of mine that was a concert/lecture series and alternative venue that I created in 1996. It’s been revived at various locations since many of the events took place in the various places I lived in Greencastle. Sometimes other music students requested I do an event in their dorm room and often events would be “site-specific”–taking place around Greencastle or on DePauw’s campus. For example, for one performance installation, I gather a couple of railroad ties (you would not believe how heavy these are) and dragged them to the Emison Art center and used wire hangers to create limbs in a makeshift tree adorned by packing materials I acquired at the University Bookstore (where I worked at the time). It was an audience participation piece. Sometimes I would give more “formal” performances of new compositions, text/sound/art works, multi-media and performance art. Other times I would give “lecture/performances” focusing on particular composers or artist I had an interest in at the time. 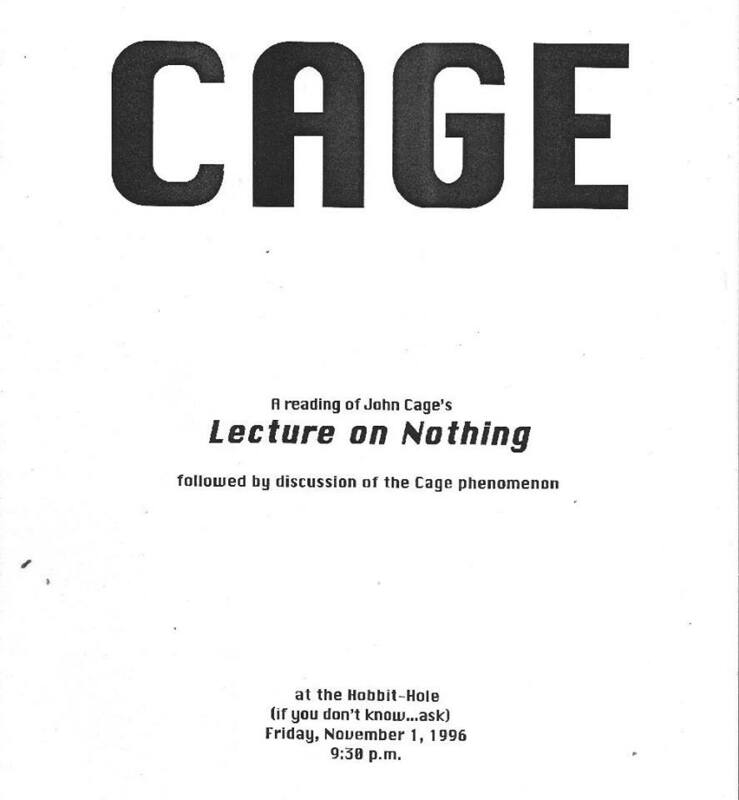 Often I would simply do performances of John Cage lectures. I would plaster the campus and School of Music with flyers for the events, such as the ones above, and almost invariably included a printed program with more detailed notes, some quotes, and other supplementary materials. 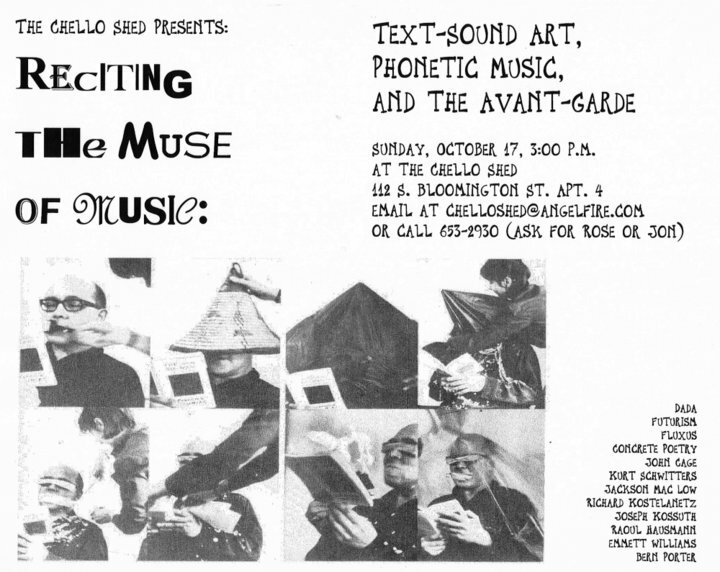 I also published a handful of “…from the Chello Shed Newsletter” which featured other DePauw students and Greencastle community members’ art, scores, text as well as an accompanying cassette tape of experimental text and sound works. I’m in the process of archiving the early activities as the Chello Shed was most active between 1996-1998 (well over a hundred events) with more intermittent activity from 1998 to 2002. In the show I mentioned at Lisa’s Oak Street Lounge I’ve revived it and presented the concert under its auspices. Mitch Merback graciously allowed me to sit in on his Art Criticism class a couple of years. By that point in time I was already heavily into Performance Art and how the visual arts world intersected the other arts and had started doing the Chello Shed events. For a while I was actually a double major in studio art and music performance but had since dropped the studio art major as I found I wouldn’t ahve time to complete the requirements. 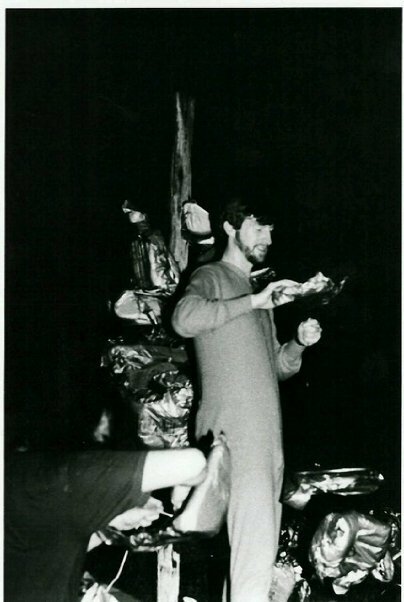 During that time I’d also recently attended the Performance Art, Culture, Pedagogy Symposium at Penn State (November 1996) and had many wonderful discussions about the arts with the other students and Mitch. In 2000 I would attend the follow-up symposium at Penn State: Performative Sites: Intersecting Art, Technology and the Body where I’d reconnect with a number of performance artists and meet new ones. Despite having spent most of my early life growing up in bi-lingual environment (the first songs I learned how to sing were in Thai) I didn’t really explore world music until I got to DePauw. Occasionally world musicians would be brought in for performances and to do workships. I’ve had the pleasure of doing workshops and seeing performances by the late Prince Julius Adeniya, Srinivas Krishnan, Chirgilchin, and others I can’t recall right now. As most of you know I’ve spent the last ten years often playing with world musicians or sharing bills with world musicians from all over the world as well as fusion world groups from all over the US. Not long after Dr. David Ott left DePauw the Music School phased out the Composition program much to my dismay. While they had a composition professor they never really filled the full time position. I must have performed and premiered several dozen student works while I was a student (as well as a while after) and that was one of the greatest experiences–working with young and budding composers, some of whom are still doing great work. Last, but not least, I have to mention Dr. Eric Edberg. He’s probably still one of the biggest inspirations and mentor in my life and I probably owe as much for my current career trajectory to him more than anyone else. While I was in school he was getting heavily into improvisation and often worked with his cello students in various techniques he was learning. 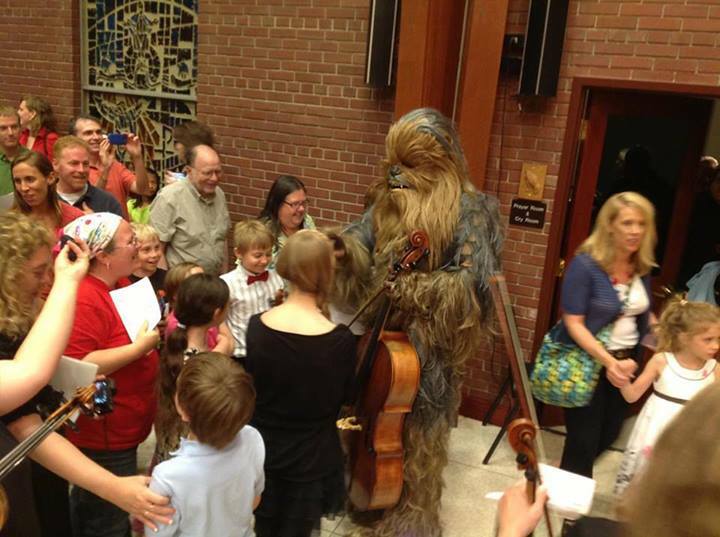 Eventually he formed an improvised chamber music class that has since become very popular. These are some of the things happening at the end of the 20th century at DePauw that have helped to shape what I am as a 21st century musician. I now run a new music ensemble, the Mothership Ensemble, with two other wonderful composers (Rachel Short and Jacob Gotlib) and a great group of students, community members and professionals; I have an interactive video and cello project, Camera Lucida, with video artist Roxell Karr which works in close collaboration with dancers and movement artists; I still run my solo experimental noise project which had its roots back in Greencastle, Noiseman433–I’ve since branched out more into found instruments (such as my fishtank performance) and incorporating world instruments (like my erhu); I regularly perform world music with my group il Troubadore as well as with other world musicians and with other instruments and my voice; I perform on baroque cello with Bourbon Baroque and modern cello with local classical musicians and community orchestras; and I perform amplified cello with a local rock group, Mercy Academy, and often work with local bluegrass, folk, hip hop musicians, and poets. for a show. I guess, in a way, all these things are “out of this world” (and century, for that matter), but I’m still excited about future possibilities since there’s still a whole universe of music to be explored and I thank all those mentioned above (and those I haven’t mentioned) for helping me map this musical journey. Two of the most turbulent times for musicians happened due to the film industry. Or rather, I should say that the film industry disrupted live performing music culture twice. The first was when Cinemas started to replace the thousands of Opera Houses in the US as entertainment destinations for the population. The second was with the advent of sound in cinema which forced an estimated 22,000-26,000 musicians out of work in just a few short years in the late 20s. So it’s with a little bit of irony that live music for film is making something of a comeback. Most of us are familiar with Philip Glass’ 1994 “La Belle et la Bête” – and opera for his ensemble and film. 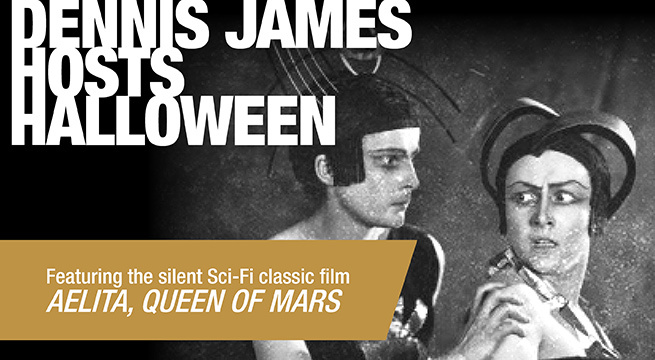 Less familiar is the Filmharmonia Duo which began as a musical project to recreate the music for the 1920 Russian Scifi silent film, “Aelita, Princess of Mars,” back in 1990. The project has since recreated other scores to other works with Filmharmonia Ensembles that have toured around the world. 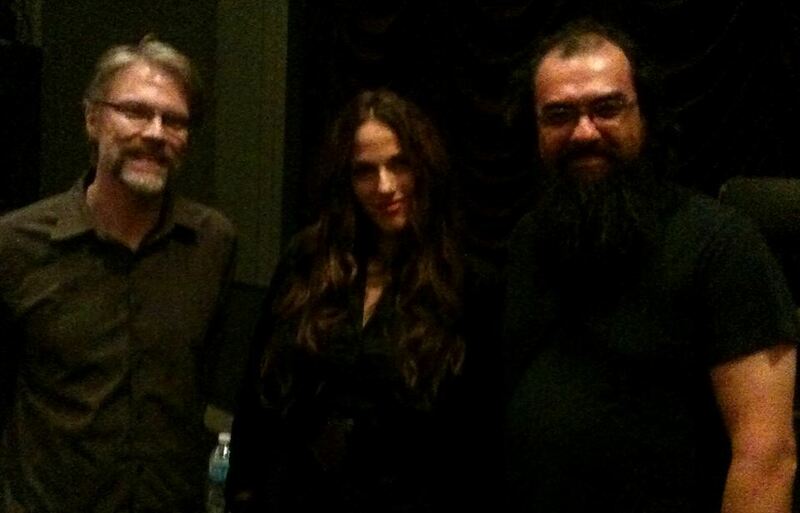 I discovered the Filmharmonia Duo (in an IU Auditorium brochure) just last week when my partner in Camera Lucida (an interactive video/cello project) while attending a performance at the 2013 Orphans Midwest Film Symposium at IU given by filmaker, Bill Morrison, and the ever awesome cello goddess, Maya Beiser. It was the world premiere of All Vows with music by Michael Gordon and the program included “Light is Calling” (music again by Michael Gordon), “Cello Counterpoint” (music by Steve Reich) and “Just Ancient Loops” (music by Michael Harrison) all accompanied by film by Bill Morrison. I’d first seen the Reich piece and video on a recent TEDtalks presentation given by Maya Beiser. The presentation also featured David Lang’s “World to Come” with video by Irit Batsry. Roxell and I spoke to Maya for a bit about my video and cello project (the previously mentioned Camera Lucida). Some of that was explaining the program, Isadora (named after dancer, Isadora Duncan), designed by programmer Mark Coniglio for Troika Ranch specifically for real time manipulation of media. In our case, video. 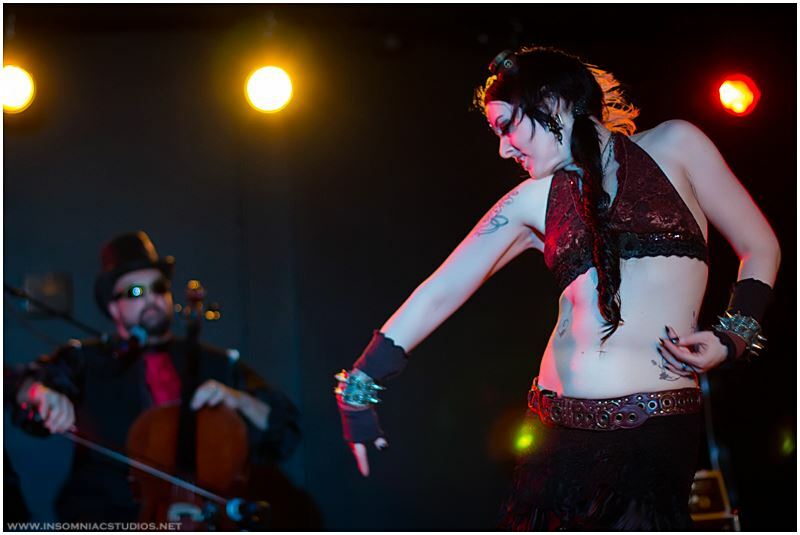 Here’s an excerpt of our first performance in Madison, Wisconsin last year with dancer, Christine Olson. So Camera Lucida is designed specifically to work with dancers and movement artist though two of our upcoming projects will be more along the traditional lines of live music for film as we develop a documentary focusing on the local Steamboat Culture in this area and as I score music for the silent film Phantom of the Opera which will also feature my new music group, the Mothership Ensemble. There are still some of the more traditional performances too. 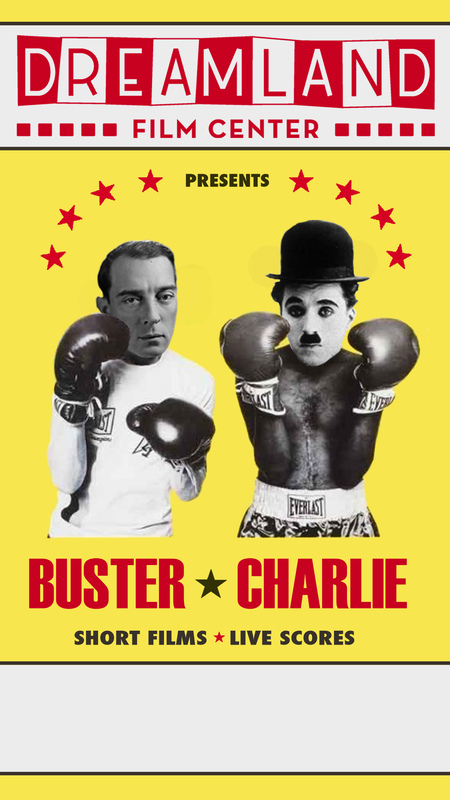 For example, a local film series happening here (sponsored by the Louisville Film Society) in Louisville had showings of Buster Keaton and Charlie Chaplin films back-to-back but with a different ensemble for each performance. A local big band did the first performance and Bourbon Baroque (a Baroque Orchestra I often play with) did the second and a Hip-Hop artist did the third. 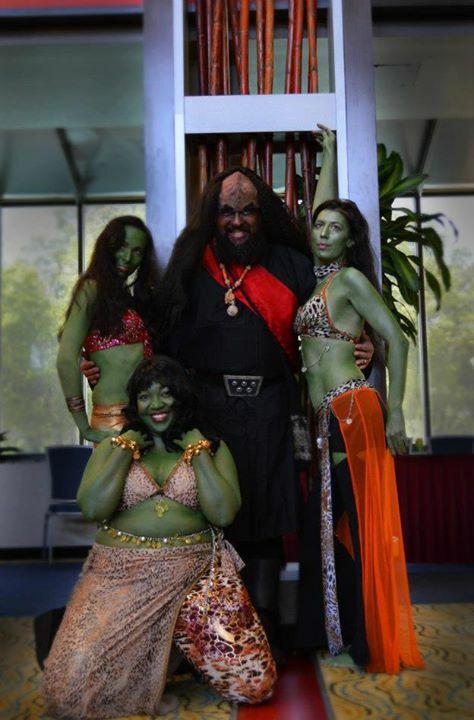 Large ensembles are also getting into the act. 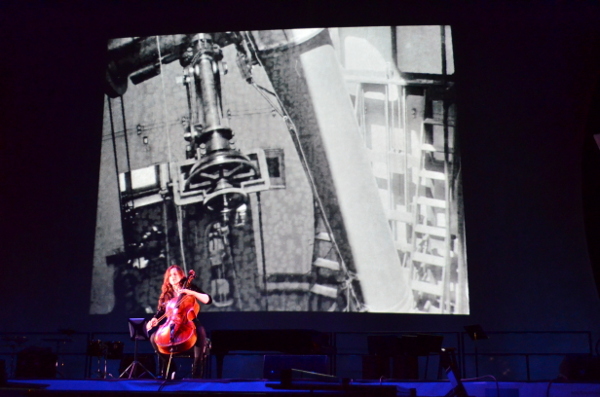 Greg Sandow mentioned the recent “Art of the Score: film week at the Philharmonic projects” by the New York Philharmonic which had screenings of Hitchcock films and “2001: A Space Odyssey” with live scores performed by the orchestra (September 17 – 21, 2013). The 21st Century Symphony Orchestra and Chorus, a full orchestra/choir that regularly performs live concerts of scores during live projection of films, From what I understand, have featured the Harry Potter, Lord of the Rings, and Star Trek movies and a number of the Pixar films to sold out audiences throughout Europe. I look forward to seeing what tomorrow will bring!